LankaWeb – Life Abroad – Part 91 ON HIS BIKE ALL THE WAY TO UK! Life Abroad – Part 91 ON HIS BIKE ALL THE WAY TO UK! Arthur L Alvis in his youth reached his ‘dreamed land’ (England) in 1954 converting his young and mighty calf muscle power into the pedals of a push (Raleigh) bicycle, which he used to boast about as energy generated out of ‘Kiri Kos’ (Jack curry) and ‘Kurumba Londha’ (Kernel of young coconuts)! Using his 2 HP calf muscle power, it took him over eighteen months to cross over fourteen man made frontiers from Colombo before he could reach England. It was a challenge and a dream he had to fulfill which became a fixation in his mind that drove him to take such a bold step in that manner when no one had ever dared before! After such an exhausting journey across unknown territories, he finally ended up in a TB sanatorium in England where he had to spend almost the same amount of time to recover from tuberculosis, which he had contracted during his cycling tour. Immigration control was not restrictive at that time, so once recovered completely from his illness he did many a job from hospital porter, kitchen-hand in London hotels and then as a concierge at star hotels. Finally he joined the H.M. Government Clerical Service as a white-collar worker and later got married to an English girl and produced a son. Arthur was determined to be a self-made entrepreneur! Seemingly he decided on a business, which he thought would be beneficial for the entire Sri Lankan community in the UK. In this regard another well established Sri Lankan in the travel business (Joshua?) afforded him the opportunity to gain the requisite experience in the UK travel trade. Arthur was a fast learner, and once he mastered himself with the nitty-gritty of the travel trade he decided to open his own travel company in the heart of London’s Regent Street alongside with other big names such as Pan American and British Airways. These two international airline giants identified Arthur’s potential and appointed him as their Coordinator, which helped him further to forge ahead with the air travel trade. 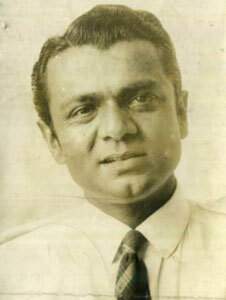 Next step in his agenda was to form a social club with the intention of chartering planes from London-to Colombo. The Anglo Asian Social Club was set up later for this purpose. Arthur Alvis was a socialite, who possessed the gift of the gab, and his marketing skills blended harmoniously with the fluency of his English language to flourish. In his next move, he managed to rope one of the youngest Lords of the Manor, a leading Queen’s Counsel to support his entrepreneurial activities. This rare specimen of a Sri Lankan soon embarked on charter flight operations from the heart of London, which helped mainly Sri Lankans living in the UK to visit home during festive seasons and school holidays at cut-rate prices on airfares. I too had the occasion, as a student, to fly home in Arthur Alvis’s inaugural charter flight to Colombo for as little as £112! Arthur executed this operation for five consecutive years successfully until such time stringent civil aviation regulations in the UK managed to cripple the cheap London-Colombo holiday flights altogether to the disappointment of many Sri Lankan expatriates (especially families with children). The vacuum created by the sudden stoppage of charter flights was replaced soon by cheap international dialing facilities using phone cards that emerged into the market in England by various business minded entrepreneurs. During this era mobile phone, which has become a ‘common toy’ among children as well as the elders today, was not heard of. IPhones, I Pads, Tablets of various makes along with email facilities, face book, Skype, Google Chat, Vibor or the twitter were never heard of. More the hardships and difficulties confronted the charter flight industry, greater became Arthur Alvis’s resolve to divert his energies to develop the tourism industry to Sri Lanka. Along with Ceylon Tourist Board offices in London and Germany, major tour operators in the UK such as Kuoni, Thomas Cook etc., were more effective in their operations with colour brochures and numerous holiday packages to Sri Lanka. Arthur foresaw this area as a lucrative expanse of the business as well as to educate, promote and introduce Western tourists to Sri Lanka. To fulfill his ambition he came up with a brilliant idea to compile and publish a comprehensive colour tourist guide to Sri Lanka (Book Ref. 942282 – London: AVIS Holiday Services, containing 173 pages). Arthur was a socialite. This very nature helped him to become a close buddy of his Bank Manager in London who granted him an overdraft facility of £30,000 (lot of money at that time) to help him proceed with bulk printing of the guidebook. Arthur did much of the spadework himself by doing his own research and incorporating information, photographs, maps etc., and carried out a professional advertising campaign too. He chose a large colourful posture of the Buddha statue at Verahena Temple at Matara as the front cover for his guidebook, while the formation of the museum (underneath the statue) was under construction. He encountered his initial hurdle at the launch of the book in Colombo, which had been organised in a grand scale. To meet the deadlines he has had to remove part of the bulk of printed books from the printers in London and ship it to Colombo in order that they arrived in time to coincide with the book launch program in 1982. The unpardonable mistake he did was not to have gone through proof reading with a fine toothcomb, due to the lack of time availability, but taking the printer’s word as gospel truth for accuracy of printing. However, much to his disappointment, he found series of errors in the book, which was too late! One such was Sigiriya identified as Pidurutalagala Mountain with a completely erroneous description! Hostile journalists who reviewed the book showed no mercy but turned unreceptive towards Arthur Alvis’s efforts and came out with accusatorial criticism. In such a backdrop of adverse publicity, all hell broke loose within six months of Arthur Alvis’s arrival in Colombo when foreign tourists started to leave the country within forty-eight hours due to the JVP turmoil. The travel industry naturally hit the lowest ebb and Arthur too became marooned in Sri Lanka to face the music with more and more disastrous and unanticipated circumstances. Sri Lankan passport holders who enjoyed PR facilities in the UK had to return to base within two years of living abroad, once they left the country, to qualify for that concession, according to the immigration regulations that existed in the UK. In the case of Arthur Alvis, the circumstances that prevailed compelled him to stay put in Sri Lanka for a longer period than expected. This made him overstay in Sri Lanka than the permissible time frame to re-enter after living outside of Britain! In order to overcome impending obstacles Arthur used his intelligence and presence of mind by writing a personal letter to Mrs. Margaret Thatcher (British Prime Minister) from Colombo explaining the dilemma he was in, and seeking her kindness to re-enter Britain without conditions attached to his entry visa. That letter was copied to the British High Commissioner in Colombo at the time, David C. Gladstone, a brilliant lawyer and a grand nephew of William Gladstone (UK PM in 1894). As a final straw he sought an appointment to see the High Commissioner personally and convinced David Gladstone that his family (English wife and son) was in England. Finally the English compassion helped him to re-enter Britain again, on humanitarian grounds, which I carried as a news item at that time under the caption ‘ALA – Arrived in London Again’! When Arthur was once again back in London he tried hard to recover his losses by preparing to launch a multi-million rupee project with a sound viability report to substantiate it. Although the Director of Civil Aviation at the time gave his blessings on the project National Carrier (Air Lanka) went against it. Had Arthur Alvis approached the Minister of Finance and Planning instead of the Civil Aviation, the Minister would have certainly understood it as an ‘invisible revenue’ project to prop up the sagging tourist economy right at that time, he confided in me. Arthur Alvis became devastated both financially and emotionally amidst a barrage of problems that began to steam roll his hard resistance. As an escape route he embraced alcohol to drown his depressions and dejections, which finally affected his health and ‘unexpectedly’ had to face death in London with a lot of unfinished projects in his mind; his red BMW car was gathering dust in an abandoned stage! Arthur L. Alvis was a reliable friend, hard worker, optimist, fearless, strong-minded and a determined Sri Lankan that I ever came across and always maintained that he could not simply be discarded as a defeated pack of cards. One of my Class-mates at St. Joseph’s College Colombo, Ivan Ratnayake, who was also a Member of The Ist Port of Colombo Sea Scouts, of which too I was a member, cycled all the way to London…14,000 miles. If you Google ” Ivan Ratnayake on Bicycle to London ” You will see his Photograph and details. This was long before Arthur did it, I believe. This entry was posted on Friday, August 15th, 2014. You can follow any responses to this entry through the RSS 2.0 feed. You can skip to the end and leave a response.